(South China Morning Post) Tsang wins on policy but Leong excels at debate. By Jimmy Cheung, Klaudia Lee, Denise Hung and Albert Wong. 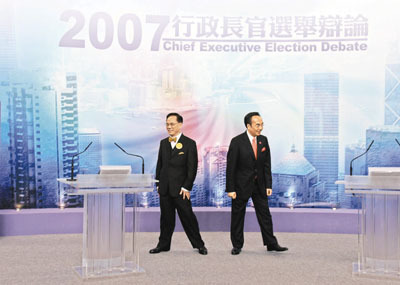 It saw Mr Tsang abandoning his guarded approach of the first face-off two weeks ago and cornering his Civic Party challenger on various fronts, including Mr Leong's strategies on universal suffrage and his awareness of the operations of Cyberport, a controversial project criticised as an example of government collusion with business. Mr Leong, who impressed the audience with his eloquent attacks last time, remained critical of government policy failures such as the lack of small-class teaching and a fair competition law. Both candidates avoided making new election promises, but engaged in sharp exchanges over the accuracy of education spending figures and the fiscal reserves. 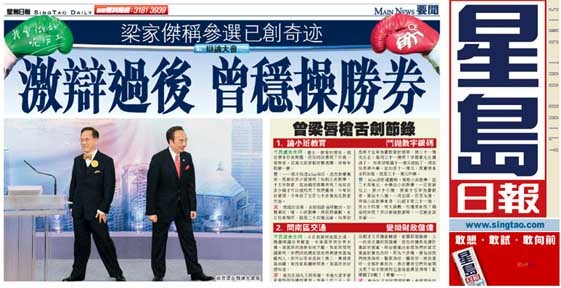 Mr Leong sought to contrast himself with Mr Tsang, saying he represented people without power, money or the vote. But Mr Tsang swiftly retorted: "I not only represent those who don't have votes. Whether they have the vote or no vote, are powerful or powerless, wealthy or poor, Hong Kong people are my bosses. I won't make Hong Kong a battleground for them and divide the rich and the poor." (The Standard) A Fighting Finish. By Michael Ng. A better-prepared Chief Executive Donald Tsang Yam-kuen Thursday took on challenger Alan Leong Kah-kit in the final sparring match before the March 25 election - and the Hong Kong University's public survey program called the outcome a draw. The 90-minute session was sprinkled with barbs as each tried to score points, bringing spontaneous applause despite organizers' calls for restraint. 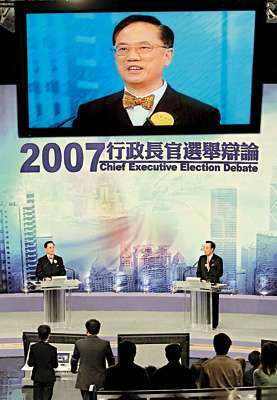 Hong Kong University Public Opinion Programme: 520 persons who watched 5 minutes or more the debate were interviewed during the program. Q2. If you had a vote tomorrow, who would you vote for? (SCMP) 'Viewing figures show more feel involved' By Denise Hung. 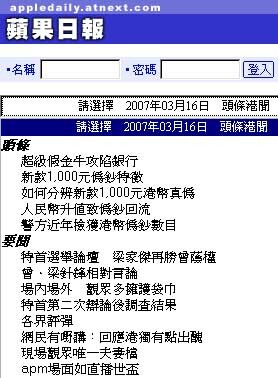 March 17, 2007. About 2.1 million people watched the second election debate, televised live on Thursday night, compared with 1.75 million viewers for the first debate. The second 90-minute debate was organised by the city's eight electronic media organisations and was broadcast in prime-time starting at 8pm. 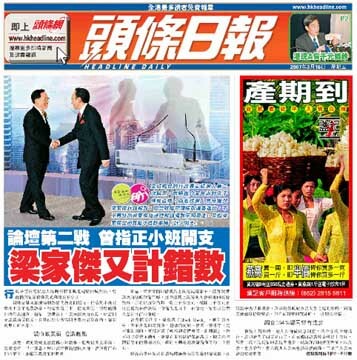 Spokesmen for free-to-air broadcasters TVB and ATV said the average viewer rating for the debate was 32 points, with the highest rating 35.6 points - equivalent to 2.07 million viewers and 2.3 million viewers, respectively, for the TVB Jade and ATV Home channels.